Alarm Clock HD is a free Windows 8 alarm clock app available under ‘Productivity’ section of Windows 8 App Store. This alarm clock Windows 8 app is just ultimate that brings you 3 world clocks, unlimited roaming alarms, currency exchange rates, weather, Facebook feed, music player, picture album, news feed and more. You can easily set daily alarm, or select some specific days to set alarm. You can also set alarm music, selecting from among the built-in tones or upload you favorite one from your local machine. Also, you can set snooze duration, type in the content about which you want to be reminded, or set an alarm picture. In addition, this free Windows 8 alarm clock app gives you the alerts with toast notifications even if you are working on a different application. But, you need to ensure that you have enabled “run in the background” option. 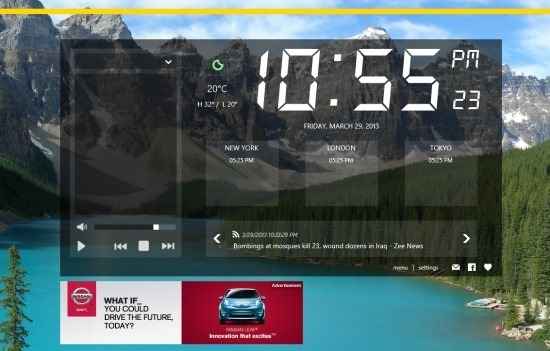 Let me quickly point out the main features of this alarm clock app for Windows 8 below. Lets you set unlimited alarms and all of them will ring on the specified time period. Brings you the updated weather for you current location. Brings you the latest time, weather updates, and currency rate for up to 3 different cities in the worldwide. Lets you create new themes using the pictures of your own choice. Comes with an in-built RSS feeds to keep yourself updated with latest news across different categories. Lets you create music playlists, adding your favorite songs. Lets you customize the HD clock using your favorite colors. Lets you read your Facebook posts from within the app. Alerts you with toast notification when alarm rings. Well.. I really found this alarm clock app for Windows 8 interesting as it comes with a number of different features. The interface is extremely beautiful wherein, you can see a beautiful background. It’s a must have Windows 8 alarm clock app. Also, check out our posts on Stop Watch Apps and Alarm Clock Apps. In short, Alarm Clock HD is a good utility alarm clock Windows 8 app where you can not only set unlimited alarms, but also check updated weather, latest news, create playlists, customize your clock, and much more. Go ahead and download Alarm Clock HD in Windows 8 now.